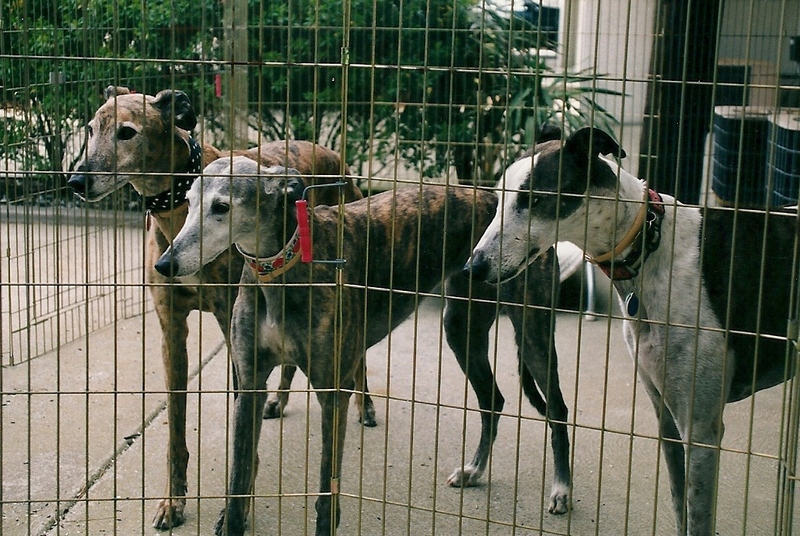 To many people who are owned by greyhounds, a fenced yard is as essential as food, water, and shelter. Many of these same people believe that, as yards go, the bigger the better. I was one of those. But what about greyhound owners without fenced yards, who live in condos or apartments with small concrete patios? What do greyhound people in interim living situations do for a fence? Is there a solution for those who do have yards but are still several dollars short of being able to get their acreage enclosed? I think so. Here’s an option that works for us. The only real hardship in leaving our too large home of 25 years, other than saying goodbye to the dog door, was leaving the acre of fenced yard that had served for years as exercise oval, potty place, and mini-resort for our greyhounds. Our new, much smaller and more manageable townhouse at the Jersey shore has no fence. It has no place for a fence because it has no yard. Our greyhounds get their exercise during walks, occasional playgroups, or when we’re lucky enough to find a fenced property available to dogs. We like to believe that as they have aged, our dogs no longer need or desire the opportunity our old yard gave them to run until they’re exhausted. We’ve convinced ourselves that they are more than content with their daily walks. However, we also believe that it’s still very important to them that, regardless of their ages, they be able to join us when we are outside and to be a part of whatever activity has taken us there. We have a definite need for a temporary, portable fence. Our solution is actually very straightforward. We attach two joined eight-panel exercise pens (a.k.a. ex-pens) to each side of the garage door. This gives the dogs a little over 180 square feet of outside area. It’s a temporary arrangement, but for us, a satisfactory one. The dogs can keep us in their sight, encourage our activity or not, or just companionably doze in the sunshine on the driveway or in the cool shade of the garage. We use heavy-duty plastic U-hooks and tie wraps to keep the ex-pen fence up. It is easy to remove, separate the two pens, and fold them to be ready to accompany us as needed. Since the pens sit on concrete, we can’t use stakes for rigidity. I doubt if our temporary fence could withstand a canine assault brought about by a carelessly discarded pizza crust or a loose cat with an attitude. Therefore, the puppers are never unsupervised while in their makeshift corral. Just as some folks prefer vanilla, others won’t have anything but chocolate. There are plenty of temporary fencing solutions from which to choose. Here are a few ideas for your consideration. Please keep in mind that the emphasis is on temporary. None of these suggestions is intended to be used as permanent fencing. There are many types of ex-pens that afford portability and a modicum of security for your hounds. Available at pet stores, through pet supply catalogues and at pet supply web sites, ex-pens are available in medium to heavy gauge (from 7 to 11) galvanized or coated metal. Heights range from 24 in. to 50 in. and the panels themselves are usually a standard 24 inches wide. Most ex-pens come in eight joined sections and many manufacturers offer extension kits of single or double panels for each of their pens. Some of the exercise pens also have a latching gate and some are equipped with attached handles so, when the pen is folded properly, transport is manageable. These metal pens can vary in price, according to size and quality, from $49 to $120 or more. Individual, solid PVC panels that generally run about 30 in. wide and 50 in. high are available from garden supply centers, catalogues, and home improvement warehouse-type stores. The panels are usually sold as single panels. Metal or PVC collars are available for these panels that make it possible to connect as many of them as desired. The panels are designed to hide air conditioners, pool filters, trash cans and so on. They are usually more attractive and afford greater privacy than metal exercise pens, but are also more costly and are not very transportable. Further, most have a rise of two inches or more from the ground. There is nothing to stop an inquisitive critter from outside going under the panel into the enclosure or, if placed on dirt or grass, a determined digger from tunneling underneath. The panels range in price from $89 to $129 and the metal collars range from $10 to $15 each. Most of us have seen the bright orange rubber or flexible plastic fencing used around construction sites and as temporary patching for existing fencing. This material is designed to be tied or tie wrapped to an existing structure, such as a tree or fence post, or to metal stakes. It comes in rolls of various lengths and heights. Its primary appeal is in its ease of transport and its relatively low cost. I’ve seen this type of fencing used for temporary runs or potty areas at greyhound and other breed picnics and special events. Although quite strong, one drawback to this type of temporary containment is that it lacks rigidity and would probably launch a charging Chihuahua into oblivion. 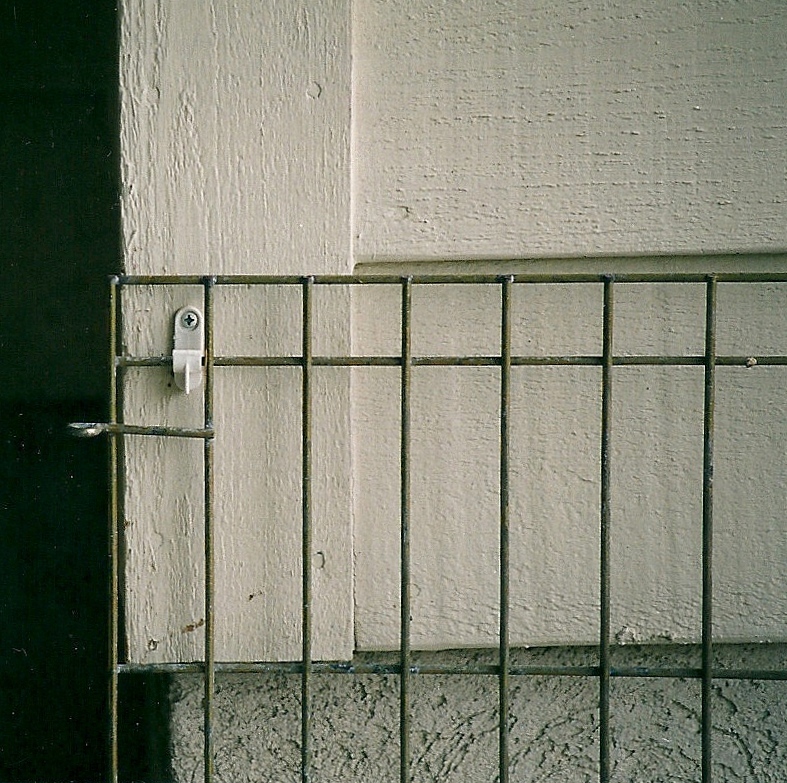 This type of fencing is made with circular or rectangular holes linked together which make the fencing too flexible for an unsupervised solution. Again, available from garden and building supply stores, prices for this temporary fencing will vary depending on the season, amount of the product you’re willing to purchase and whether the store is running a special on the item. Benner’s Gardens, a Pennsylvania manufacturer of deer deterrent fencing, have given their product a new use with their “Friendly Fence.” This is an ultraviolet resistant black polypropylene mesh fencing available in heights of 4, 5, and 6 ft. It is available on a roll of 100 ft. or 330 ft. in each of the height sizes. The company also offers the accessories needed to turn the material into a fence: posts, ground stakes, access gates, and tie wraps. They also offer vinyl coated wire for around the base of the Friendly Fence if your dog is a chewer. I’ve not seen this product other than in advertisements and can’t vouch for its stability, only its availability. An e-mail or letter to the manufacturer will get you pricing and a sample of the product. The website is: http://www.bennersgardens.com/dogs.htm. The mailing address is Box 459, Conshohocken, PA 19428.